Julie Rudie has been appointed Ramsey County Sheriff Jack Serier’s second-in-command. She takes up the role that Serier held until is appointment to sheriff on Jan. 10. Rudie is the first woman to be chief deputy at the Ramsey County sheriff’s office, and is a member of the Lower Sioux Indian Community. Rudie began working for the St. Paul Police Department in 1990. She has worked for the Ramsey County sheriff’s office since 2011. She was previously undersheriff of the administration division and now supervises day-to-day operations of the sheriff’s office, with 400 members, 200 volunteers and an annual budget of $56 million. “I’m very excited and I’m honored,” Rudie told the St. Paul Pioneer Press. Rudie has a bachelor’s degree in criminology from the University of Minnesota-Duluth and graduated from the Northwestern University Center for Public Safety’s School of Police Staff and Command. At its first meeting of the year, the Minneapolis Board of Education welcomed three new Directors who began four-year terms in January: KerryJo Felder, Bob Walser, and Native American Ira Jourdain. Jourdain was born in Red Lake, Minnesota and is an enrolled member of the Red Lake Band of Ojibwe. Jourdain has four children; two of them are currently enrolled at Bancroft Elementary School. He’s been involved in his children’s schools through volunteer work and serving on various site councils. It’s his work in human services as a Minnesota Family Investment Program Manager – helping families overcome challenges like domestic abuse, substance abuse and affordable housing – along with his experience as a Native American parent that compelled Jourdain to run for the school board. He has a keen understanding of what many families face. Jourdain is a resident of the Kingfield neighborhood in Southwest Minneapolis. His school board term will run from 2017 to 2020. The Native American Community Clinic (NACC) board of directors unanimously voted to select Antony L. Stately, Ph.D. as the new CEO of NACC. He is replacing Dr. Lydia Caros who is retiring after 14 years. Antony recently served as the Director of Behavior Health Programs for the Shakopee Mdewakanton Sioux Community overseeing the administrative and clinical direction of an interdisciplinary team of psychologists, social workers, and licensed chemical health counselors in a tribal-based outpatient setting. Prior to that, he co-directed the Indigenous Wellness Research Institute at the University of Washington in Seattle. An enrolled member of the Oneida Nation of Wisconsin, Stately graduated from South High School and attended Antioch University in Los Angles and received a B.A. in Liberal Arts. From there, he obtained a M.A. in Clinical Psychology and his Ph.D. from the California School of Professional Psychology in Los Angeles. He has held numerous positions as adjunct faculty and associate clinical professors in Washington and California and has provided consulting services for tribal, state and the federal government on key health issues across Native communities. A lecturer and speaker on mental health, historical trauma, oppression, and substance abuse, Stately is also an accomplished co-author and author on GLBTQ issues, particularly in Native communities. Stately was chosen after an extensive national search. The board enthusiastically agreed that his expertise in Native health and wellness and his considerable management skills would help NACC build on its success in revitalizing communities and lead the next phase of the clinic’s growth and development. He brings a clear understanding of how the public, private and philanthropic sectors can work together to create better health outcomes in our community and he has a long track record of identifying innovative solutions to difficult challenges. Stately’s has a calm demeanor, quick sense of humor, and a commitment to service and help others. The experience of growing up in South Minneapolis, in the heart of the American Indian community, still informs his view of the world today. First Nations Development Institute (First Nations) announced the selection of 21 tribes and Native American organizations to receive grants to start or expand nutrition education programming in their communities as part of the USDA’s Food Distribution Program on Indian Reservations (FDPIR). 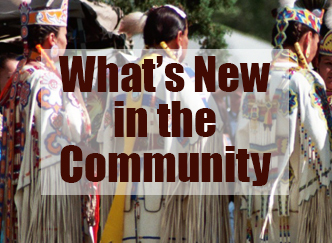 First Nations awarded a total $310,000 to 21 grantees across 12 states. The award amounts vary by grantee. Under this project, the FDPIR programs will expand access to nutrition education programs in Native communities and measure the effectiveness of education interventions. These grants allow tribes to design or expand culturally- and community-based nutrition education projects that encourage individuals and families to improve their nutrition, healthy habits, plus generally broaden access to nutrition education programs. The regional recipients are: Red Lake Band of Chippewa Indians, Red Lake, Minnesota, $10,000; Spirit Lake Tribe, Fort Totten, North Dakota, $20,000; Oneida Tribe of Indians of Wisconsin, Oneida, Wisconsin, $20,000; Menominee Indian Tribe of Wisconsin, Keshena, Wisconsin, $26,000; REDCO (Rosebud Economic Development Corporation), Mission, South Dakota, $15,000; and Thunder Valley Community Development Corporation, Porcupine, South Dakota, $15,000. First Nations has been working to restore Native American control and culturally-compatible stewardship of the assets they own – be they land, human potential, cultural heritage or natural resources – and to establish new assets for ensuring the long-term vitality of Native American communities. For more info, see www.firstnations.org.